Problems in China: Where I chronicle the disputes that occur frequently in our house. The most common reaction people have when I tell anyone that I live in a house of five girls, (four of whom are fashion students) is a cocked eyebrow and a skeptical, "So, how's that going for you?" Surprisingly well, thanks for asking. "Jessica sheds everywhere!" 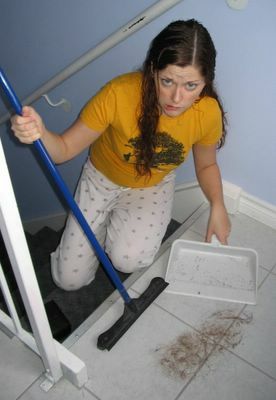 Courtney said the other day, after she completed her biweekly chore of cleaning the stairs. "How did you clean up the hair?" Brie asked. "I swept it off the stairs. But you have to pick the hair out of the broom afterwards," Court told her. "Ewww. Well, at least we know whose hair it is." I interrupted, "Actually, the worst part is, we don't know whose hair it is." Thank you random Japanese girl! This morning I swept our very short upstairs hallway, which I swept a couple of days ago. This is the lovely ball of hair I accumulated. Brie just walked into my room just now to show me this lovely display of notably blonde hair that she swept off her bedroom carpet. 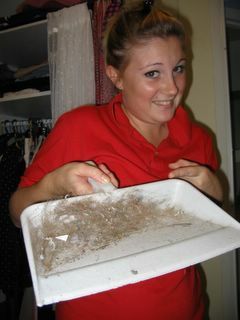 Then again, that's a month's worth of hair, not a week. Nonetheless. . . Damn. You shed more than me... And I shed my hair like crazy. Right on. I have two dogs. You should see the amount of hair that those two shed on an hourly basis! It is a plague upon our house! We've got hair-bunnies the size of Volkswagens in every nook and cranny of our house! We could knit sweaters out of that shite, I tells ya!